Or... Wedding Bells The Sequel. Yes, part two of the wedding is upon us, and Susan and John are getting ready for their big party at Cocoraque Ranch today. 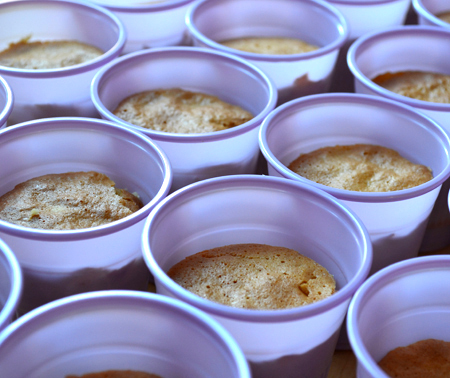 I have been busy making Cuatro Leches "cakes in cups." Not cupcakes. To keep with the informal and relaxed atmosphere of the ranch setting, Susan wanted lots of little individual desserts: lemon squares, Mexican wedding cakes, glazed donuts from Le Cave’s Bakery, cinnamon rolls from Robert’s (two Tucson traditions), and my cakes in cups. John's favorite dessert (or at least one of his favorites) is tres leches cake, a Mexican specialty. I immediately suggested individual cupcakes, thinking they would be a breeze to make. Not so. The key to a tres leches cake is poking holes all over the cake and then pouring a triple milk concoction over the top, letting it all soak in. In a test drive, I used metallic cupcake liners for support, but didn't count on the little cakes getting so large a dome during baking, that the milk mixture flowed right off the cakes onto the counter. I needed to get creative. I tried injecting the cakes with the mixture using a squeeze bottle. Nope. I tried brushing it on very carefully. Tedious doesn't begin to describe that method. I tried slicing off the domes and spooning the mix in, then recovering them. It kind of worked, but they were homely. Susan and John came for dinner and a taste test. They loved the flavor but I still felt they needed to look more presentable. What next? I needed to get more creative. In a midnight epiphany I came up with the "cakes in cups" idea. I made the cake in a 9-inch by 13-inch pan, as directed, then using a 2-inch biscuit cutter (you could use a tomato paste can), I cut little individual cakes and put them in lavender plastic cups (one of the wedding colors), and simply spooned the milk mixture in. It permeated the cakes from the sides, rather than from the top. Bingo! 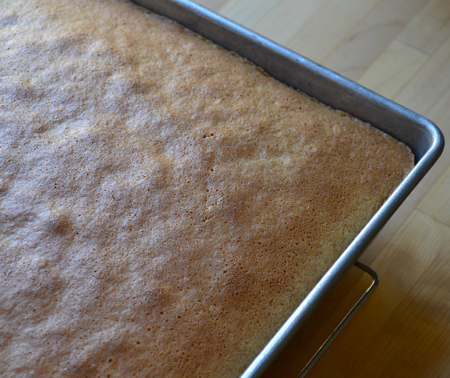 As clever and attentive readers, you may note that I began the post by writing about cuatro leches cake (four milks) and then continue by only talking about tres leches cakes (three milks). 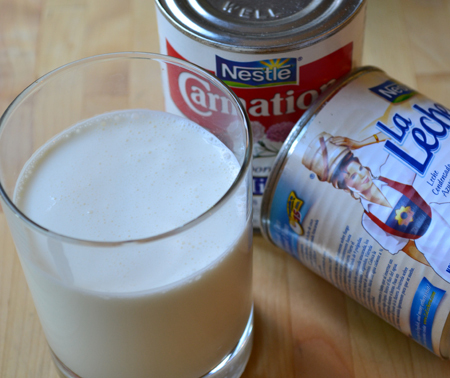 The fourth milk is courtesy of a can of dulce de leche, a cooked milk jam made from sweetened condensed milk. This is the "icing” on the cake. I piped it on with a pastry bag and then topped it with a couple of crystallized violet petals. 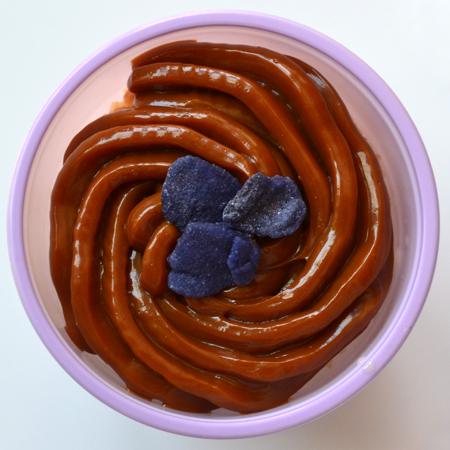 I first heard of using the dulce de leche on top from my colleague Rafael, who got it from Saveur Magazine. It was an office favorite. Yes, adding a fourth milk is gilding the lily, but this is a genuine case of more IS better! So the story ends happily, with little cakes in cups, individual spoons for each (to get every last drop of gooey, milky cake from the bottom) and a pretty presentation. This is what happens when you can't find the can opener and have to use a church key! So, with a glass of champagne raised, we toast you, Susan and John. May your journey together be filled with many joys, lots of laughter, myriad adventures, and unending love. Oh ... and a plethora of desserts! Heat the oven to 350°. Spray a 9-inch × 13-inch baking pan with cooking spray and dust with flour. Invert the pan, tap out the excess flour, and set aside. Pour batter into reserved baking pan and bake until golden brown, about 30 minutes. Set the cake aside and let cool slightly for 30 minutes. 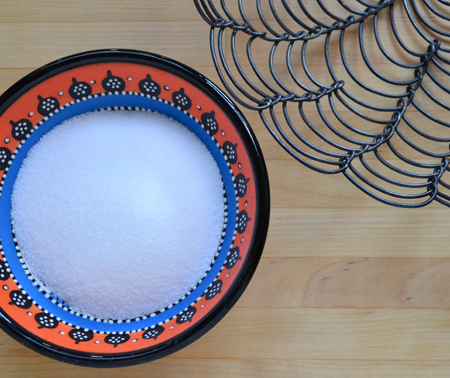 Whisk together the sweetened condensed milk, evaporated milk, and heavy cream in a bowl. Using a 2-inch biscuit cutter (or tomato soup can opened at both ends), cut as many little cakes (about 24) as possible form the sheet cake. 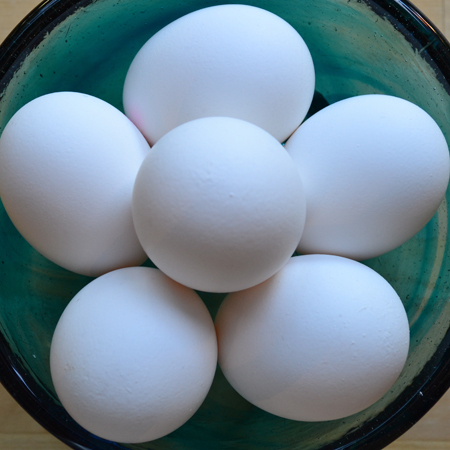 Place them in the cups, pressing slightly to get them to the bottom. 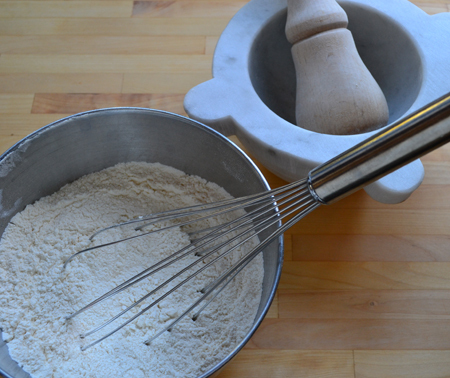 Spoon about 3 tablespoons of the milk mixture over each warm cake; it will slide down the sides and permeate the cakes. Set aside to let cool completely. 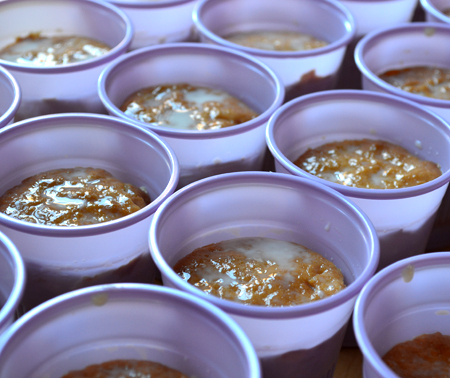 Cover the cakes with plastic wrap and refrigerate until well chilled and liquid is absorbed, at least 4 hours. Scrape the dulce de leche into a pastry bag and pipe (using a star tip) over each cake. Refrigerate until ready to serve. Top each with a candied violet petal or two just before serving. Makes 24 cakes in cups. i just drooled.... i love tres/quatro leches cake :) and you are such a thoughtful friend and cook! i love it! Clever and so pretty David! 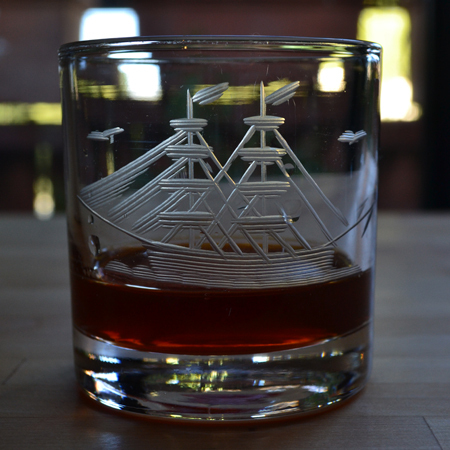 I think the fourth addition is perfect, and makes it very decadent, good for a celebration. 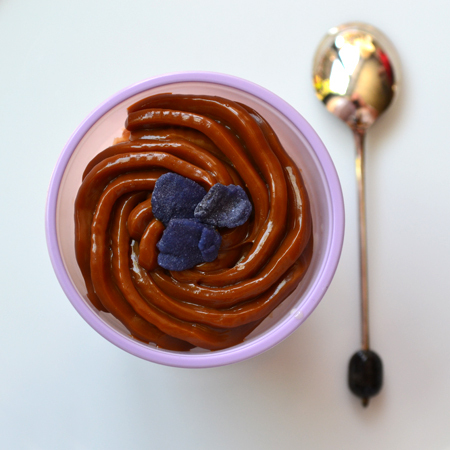 Condensed milk is after all, half way dulce de leche, so no wonder it works. I yet have to make my first 3 or 4 leches cake. Will get there soon. So nice and loving of you to make the dessert for them. Have a nice week guys! 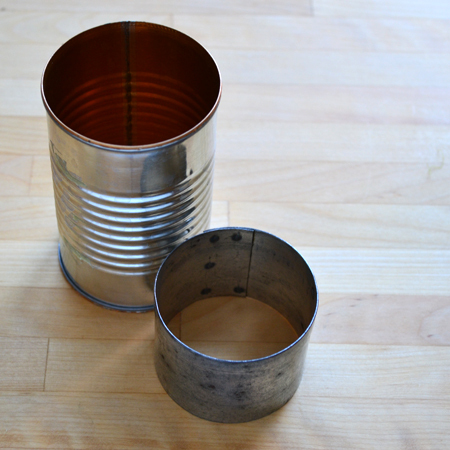 These definitely give the whole concept of solo cups at a party some serious classing up! Beautiful, I'm certain VERY tasty, and extremely clever, but I'd expect nothing less from you! Have a wonderful time at the wedding, and to the bride and groom, MAZEL TOV!! Paula - is a tres leches cake a tradition in Buenos Aires? Or some variation in it? So curious... Your love of dulce de leche will definitely have you wanting to make th cuatro leches cakes! Somehow, though, a song that sings of a lavender Solo cup just wouldn't be as catchy, Karin! The wedding was beautiful - so ralxed and heartwarming to see their honest and genuine love for one another. Very clever, David, very clever! And delicious, I'm sure. Thanks, John. I don't think anyone suffered too greatly when eating them! My mouth is watering, D! 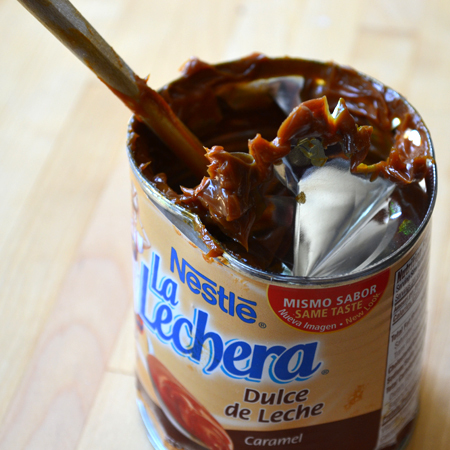 I love that Nestle canned dulce de leche. I don't know how many cans of the stuff we have in our pantry! Colette, I know what you mean - it is dangerous stuff! And I keep at least 3 cans of that and 3 cans of their Media Crema around at all times. What a gorgeous idea! I am definitely keeping this one at front of mind should I need to make individual cakes. And I agree that there is always room for one more leche. Anna - I tried to think of a way to squeeze in a fifth, but no luck yet! Maybe a dab of crème Chantilly on top? David - been so busy this is the first chance I've had to look at this one! I was the officiant AND baker for wedding of the daughter of my best friend last fall and her request was for Mexican Wedding Bell cookies (I made close to 300) and Tres Leches cake. We decided on a small (8") 3 layer for the bride and groom (with dulce de leche betwee layers) and cupcakes for all the guests. Would that I had seen your wonderful idea prior to this venture. I used the paper/foil cupcake liners to bake them, then pulled the paper off, put the loosened foil on and then back into the cupcake pans. From there to the saturating with heavenly milks (after experimentation I found that the addition of rum and cinnamon went perfectly with the milks). Then had to remove said cupcakes to flared cups and finally pipe the whipped cream! It was a major chore but they were a huge hit. I just wish I'd thought of your very simple solution. Sorry this is so long - just wanted to share! That is why I am so glad I did a trial run! Your solution wad brilliant, too! (I am glad my wedding was smaller!) And whipped cream? Brilliant - a cinco leches cake could be had! Your hard work made our wedding the best ever! We got many compliments on these cakes and the cookies as well. We can't thank you enough for your talent and generosity. John - it was really one of the most fun things I have done in ages. It gave me a chance to be creative AND make the two of you happy!